By Keith Cowing on February 25, 2012 7:56 PM. Keith's 25 Feb note: Looks like NASA has adopted the adventure movie promo production approach - loud music that tells you to pay attention, quick edits, all for the new video Commercial Crew Program video "Taking America To New Heights". This video only appears on the official NASA KSC YouTube channel. No mention is made anywhere else at NASA. Who is the intended audience for this? The public? Congress? Media? What did they spend on it? If they are going to spend time and money on this sort of stuff at HEOMD then, at a minimum, they should promote it to get their money's worth. This video makes heavy use of animations produced by a variety of commercial space contractors, with NASA's logo on it with this curious caveat added to the video page: "If a recognizable person appears in this video, use for commercial purposes may infringe a right of privacy or publicity. It may not be used to state or imply the endorsement by NASA employees of a commercial product, process or service, or used in any other manner that might mislead. Accordingly, it is requested that if this video is used in advertising and other commercial promotion, layout and copy be submitted to NASA prior to release." This is just goofy. First NASA makes a video that goes out of its way to hammer home an overt endorsement of commercial space into your eyeballs and eardrums - and then they post a disclaimer that says that "It may not be used to state or imply the endorsement by NASA employees of a commercial product, process or service, or used in any other manner that might mislead." Moreover, NASA won't let the people/companies who actually created the source videos and imagery of their own products that were edited (with taxpayer dollars) to make this video - unless NASA says that they can. Am I missing something? Keith's 29 Feb update: The video was originally posted on the official NASA KSC YouTube page here. That video has now been deleted. But it is still online on a non-NASA YouTube page here. NASA also posted it here on NASA.gov. So why did KSC delete it (with its odd disclaimer) while NASA.gov added it online elsewhere? Oh yes, oddly, there is no mention whatsoever of this video at the official NASA Commercial Crew webpage. By Keith Cowing on February 23, 2012 1:42 PM. Keith's 22 Feb note: NASA Langley Research Center (LaRC) has their "Future Innovation" website online (screen shot in case they change things). Curiously, it has this odd copyright notice on it. " Copyright Future Innovation 2012. All Rights Reserved." How can a NASA.gov website be the copyright protected property of anyone/anything other than the Federal government? Indeed, by default, virtually everything NASA does is in the public domain. 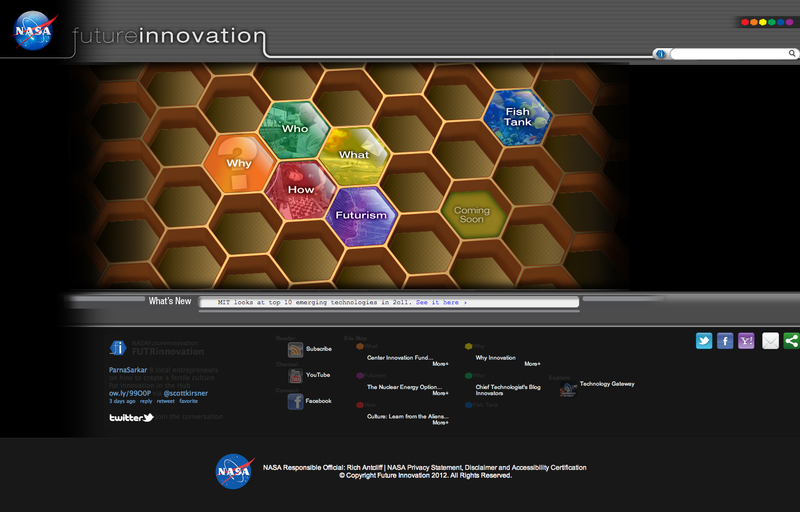 This website is all about "innovation" (it says so), but has been noted with regard to the NASA Technology Gateway (also operated by NASA LaRC), this "Future Innovation" website is oblivious to the recent spate of technology transfer notifications that LaRC has been posting over the last several months. Why is that? Is it that these NASA LaRC tech transfer announcements are not "innovative"? NASA LaRC CTO Rich Antcliff is listed as the responsible NASA official. Maybe he can explain the copyright notice and the continuing eforts by LaRC to ignore all of the new technology that his center is announcing via the Federal Register. Keith's 23 Feb update: Not a day seems to go by when one part of NASA LaRC sends out an innovation, tech transfer, or advanced technology notice while the rest of the Center's CTO/Innovation activities ignore the notice - as does the rest of the agency's CTO/Spinoff organizations. Is anyone actually in charge of this or is it just a free-for-all? This notice was posted in the Federal Register today. No one at NASA.gov has taken notice. 'NASA Langley Research Center (LaRC) seeks to enhance the use of the Center's distinctive lab and facility capabilities to support government and commercial aerospace activities. We believe the extraordinary resources available at NASA Langley, including facilities, labs and human capital, can be of great benefit to the nation and enhance technology development and infusion." Keith's 23 Feb later update: @NASATechGateway sent a direct message by Twitter (they are unwilling/unable to tweet this to all of their followers) containing this non-obvious link to a "marketplace" - one wherein teeny tiny icons (that cannot be read) are shown in a large pile. When downloaded, it is clear that the titles on these documents do not mesh with what has been posted in the Federal Register. I guess this is unimportant. By Keith Cowing on February 23, 2012 11:25 AM. "[Andrew] Stalbow also mentioned that National Geographic and NASA have signed on as launch partners. "Science and education are very important to us, and we're very excited to have NASA and National Geographic as launch partners on Angry Birds Space," he said. Unfortunately, the Yahoo story was short on details about the nature of the collaboration and neither Rovio nor NASA responded to a Los Angeles Times request for comment Monday morning." By Keith Cowing on February 22, 2012 12:23 PM. "As was the case with the previous schedule slip, Dulles, Va.-based Orbital placed the blame for the delays squarely on the Virginia Commercial Space Flight Authority, which is responsible for preparing the launch pad for Orbital's Antares rocket -- formerly named Taurus 2 -- and its Cygnus space station cargo module." "Unfortunately, the first flight of our new Antares medium-capacity launch vehicle, the rocket we formerly referred to as Taurus 2, was delayed again in the quarter," Thompson said in a quarterly conference call with investment analysts. "This was caused by problems of completing construction work on the launch pad's propellant handling and pressurization systems." By Keith Cowing on February 21, 2012 10:00 AM. Keith's 25 Jan note: No mention of these tech transfer opportunities at NASA OCT. No mention at LaRC Technology Gateway (but they mention LENR/cold fusion), No mention at NASA TechBriefs. Unless one reads the Federal Register, all of these nifty NASA spinoffs and discoveries just go unnoticed. Keith's 31 Jan update: Hey, there's more spinoff goodness coming out of LaRC - but NASA still doesn't seem to want to promote it - other than burying it in the Federal Register. Go figure. Keith's 21 Feb update: LaRC keeps spinning these things out and yet their website, OCT, and NASA Tech Briefs still continue to ignore them. By Keith Cowing on February 9, 2012 11:00 PM. "NASA will take only an $89 million cut in its topline spending request for fiscal 2013 compared to this year's operating plan, sources said Friday, but the $17.711 billion NASA budget proposal due out Feb. 13 will axe the joint effort with Europe to return samples from Mars to pay for development overruns on the James Webb Space Telescope." "Jim Bell, a planetary scientist at Arizona State University who also serves as president of the nonprofit Planetary Society, said "there's some validity" to the criticism of NASA's budgetary record. He said the scientific community "has heard that message" and is trying to focus on the highest-priority planetary projects for the next decade, including missions to Mars. "The community has a responsibility to demonstrate that we can do this within cost limits. ... If there are to be cuts, let's try to make them as fair as possible," he told msnbc.com. "It would seem to be fair if everyone across the board is being asked to scale back. The cuts should be equitable, but I don't think we're seeing that." "Schiff described his meeting with NASA Administrator Charles Bolden as "tense." "What I'm hearing that they're proposing will be absolutely devastating to planetary science and the Mars program," Schiff said. "If this is what they have in mind, I'm going to be fighting them tooth and nail." "Two scientists who were briefed on the 2013 NASA budget that will be released next week said the space agency is eliminating two proposed joint missions with Europeans to explore Mars in 2016 and 2018. NASA had agreed to pay $1.4 billion for those missions. Some Mars missions will continue, but the fate of future flights is unclear." Keith's note:Meanwhile the James Webb Space Telescope crowd is eerily quiet. They know that the cost being covered for their latest overrun grossly eclipses the cuts that are being made elswhere. Alas, the grossly over-budget and oft-delayed MSL is on its way to Mars while the grossly over-budget ISS orbits overhead. 50 years of doing this - and NASA still can't figure out what things will actually cost? Continue reading NASA's Gloomy Budget Outlook for Planetary Science. Is Earthbound Innovation Outpacing Microgravity Research? By Keith Cowing on February 9, 2012 8:52 PM. "Johnson Space Center innovators created a rotating wall bioreactor that mimics microgravity conditions, allowing for healthier, more natural-forming cell cultures. Licensed to Synthecon Inc. of Houston, the technology now enables drug development and medical research into treatment for conditions such as diabetes and cancer." "Scientists at the University of California, San Diego have developed a new method for making scaffolds for culturing tissue in three-dimensional arrangements that mimic those in the body. This advance, published online in the journal Advanced Materials, allows the production of tissue culture scaffolds containing multiple structurally and chemically distinct layers using common laboratory reagents and materials. According to the UC San Diego researchers, this process is more affordable and widely feasible than previous methods that required expensive equipment and expertise." By Keith Cowing on February 8, 2012 12:02 PM. "NASA intends to begin a new initiative, the Commercial Crew integrated Capability (CCiCap), to facilitate industry's development of an integrated CTS. This activity is expected to result in significant maturation of commercial CTS ." "A Pre-Proposal Conference will be held on February 14, 2012 at 8:30 a.m. (EST). 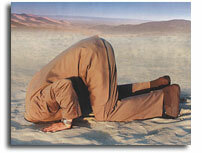 The conference will not be available via teleconference or webex." Keith's note: First NASA quietly "announces" today's event last Friday less than 4 days before the event (with a weekend in between) - and only in the Federal Register. No media advisory. Suddenly, Charlie Bolden is blogging about this. Then they toss out news of a workshop and they haven't the inclination or the know-how to do a simple telephone dial-in or Webex for the rest of the U.S. (like they did today)? Its like these commericial folks just do not know what they are doing until the last minute - and then they would rather have as few people know what they are up to as possible. Keith's 8 Feb update: But wait, another part of NASA has figured out how to do what KSC does not know how - or does not care to try - to do. Indeed, this sounds far more complex than a simple telephone/webex hook-up to a procurement dog and pony show like KSC's: NASA JSC Multi-Purpose Crew Vehicle Program Integration Contract Virtual Industry Day: "NASA/JSC intends to conduct the Multi-Purpose Crew Vehicle Program Integration Contract (MPIC) Virtual Industry Day via WebEx on February 28, 2012 from 9:00 a.m. - 12:00 p.m., Central Standard Time (CST)." Continue reading More Botched PR by the Commercial Crew Crowd (Update). By Keith Cowing on February 8, 2012 7:33 AM. "By extending the learning period, we're opening the door for continued growth and job creation, while also helping keep America at the forefront of space travel and exploration. I look forward to seeing what comes next from this burgeoning industry," said House Majority Whip Kevin McCarthy (R-Calif.)." "The Commercial Spaceflight Federation welcomes Congress's passage today of the Federal Aviation Administration reauthorization bill, which includes a key provision granting regulatory stability to the commercial spaceflight industry." By Keith Cowing on February 8, 2012 7:30 AM. "The moon continues to surprise and enthrall us with possibilities for scientific breakthroughs, resource utilization, and human exploration. We only scratched the surface of the moon's potential during the Apollo program, covering an area smaller than Coors Field during Apollo 11. It's time to go back to the moon -- and, this time, to stay." "Lost in the laughter over the past two weeks has been GOP presidential candidate and former House Speaker Newt Gingrich's core point about America's future in space. We shouldn't just explore space, we should develop and even settle it, using the same enterprise-friendly approaches that helped open the West and the skies." By Keith Cowing on February 8, 2012 7:28 AM. "In 1983 he developed Spacehab, a pressurized module that fit inside the cargo bay of the space shuttle. He had envisioned it for human cargo." By Keith Cowing on February 7, 2012 3:00 PM. "NASA leaders from Langley Research Center in Hampton and Wallops Flight Facility on the Eastern Shore will join aerospace industry representatives statewide to bring this message to Virginia General Assembly members on AeroSpace Days 2012, Wednesday and Thursday, Feb. 8-9, in Richmond. Concluding the two-day event, media are invited to a news conference at 10:30 a.m. Thursday, Feb. 9, in the General Assembly 4 West Conference Room." Keith's 6 Feb 10 pm EST note: No mention on the WFF website- but it is mentioned at LaRC. Keith's 7 Feb 10 am 3 pm EST note: Still no mention by Wallops. This is pretty pathetic. Wallops expects to get attention in Richmond and yet their management is incapable of updating its own website about this event? Not even the local media (Daily Press, Virginia-Pilot, Delmarva News) has picked up on it. By Keith Cowing on February 6, 2012 8:12 PM. "The Aerospace Industries Association welcomes House and Senate passage of the conference report on H.R. 658, the "FAA Modernization and Reform Act of 2012." It is critical to FAA operations and offers stability and predictability to the aviation industry instead of the uncertainty fueled by one short-term extension after another." By Keith Cowing on February 6, 2012 7:27 AM. "When released next week, President Obama's 2013 budget will undoubtedly kick off another round of discussions over how much to spend on the nation's space program and which space projects should be funded. In this era of austerity, a likely issue will be NASA's support of commercial space enterprises, which some view as low priority." By Keith Cowing on February 5, 2012 5:40 PM. "The National Aeronautics and Space Administration (NASA) will present an updated status of the Commercial Crew Program (CCP) strategy on Tuesday, Feb 7, 2012. The Forum will be held at the Press Site at Kennedy Space Center from 11:00 a.m. to 12:00 p.m. The Commercial Crew Program will accept clarification questions during the forum webcast from attendees and via teleconference. Webcast access is encouraged. However, individuals may attend the forum by pre-registering online." Keith's note: Its great that NASA is webcasting these events - but giving only 4 days advance notice - 2 days of which are over a weekend, no press release, no media advisory etc. is a good way to decrease attendance/participation. By Keith Cowing on February 2, 2012 8:05 PM. "Notable speakers will include: The Honorable Robert McDonnell, governor, Va. ..."
"Virginia is one of handful of states with an operational spaceport courting the aerospace companies. Proposed legislation would boost the authority's budget to $15 million from roughly $2 million in 2011. If approved, the authority will likely double its staff to 12, hire more contractors and, possibly, begin work on infrastructure projects, Reed said. Additional legislation would shrink the board to nine members from 13. Two reports released last year recommended changes to the board, which is made up of state officials, local elected leaders, private industry and academics." By Keith Cowing on February 2, 2012 1:33 PM. "We found NASA's Recovery Act internal controls were generally effective in ensuring proper oversight, management, and transparency of Recovery Act funded SBIR/STTR contracts. The contracts we reviewed largely met cost, schedule, and performance milestones. ... However, we also found that due to resource limitations NASA did not implement three Recovery Act internal controls, including two controls relating to COTR certification and training." By Keith Cowing on February 2, 2012 11:28 AM. "United Launch Alliance (ULA) today announced the completion of two key milestones leading toward the certification of the Atlas V launch vehicle for human spaceflight. ULA has successfully completed the third and fourth milestones of its Commercial Crew Development (CCDev) Unfunded Space Act Agreement (SAA). In December, ULA conducted a series of detailed reviews that reflected the culmination of efforts involving technical experts and representatives from NASA's Commercial Crew Program (CCP)." Keith's note: Little more than a week ago, at an campaign event with Newt Gingrich, Gingrich asked a bunch of space company reps specifically what it would take to human-rate the Atlas V and how long that would take. No one from ULA could answer. Now this press release comes out addressing that same question in detail. Odd. By Keith Cowing on February 2, 2012 12:37 AM. "What if you could use your phone to test the air for toxins? What if you could monitor your health simply by blowing on it? Sounds amazing, right? Nanosensor technology developed by NASA Ames is going to make that a reality." Keith's note: NASA Ames PAO worked with Gizmodo to generate this article - and others - as part of their "SpaceCamp" series that looks at things inside NASA. Other than a tweet about his series of articles by NASA CTO's Joe Parrish who is actually paying attention (alas he only has 72 followers - please follow him) NASA has done zippo to promote this spinoff. The more things I find written about the value of NASA research the more I find evidence that NASA is asleep at the wheel. This stuff mostly gets written in spite of NASA. And when NASA does assist people as they write stories the agency is clueless as to how to make a simple link on their website to the stories that result. I am beginning to think that NASA simply doesn't care any more. And if they don't have the energy to do simple PR 101 sort of tasks, why should anyone care what the agency gets in terms of a budget? And who will complain when the budget is cut? Just like the kidney stone spinoff work NSBRI is doing, this NASA-developed sensor array also has the potential for wide utilization here on Earth. But NASA would rather not expend the energy to tell the ultimate stakeholders - i.e. taxpayers - that this is the cool payback that they get for all those billions spent on NASA. Mind boggling. Keith's update: I am partially wrong. NASA ARC did release a short press release about chemical sensors for a smartphone. But look at the pictures that were released. They are for another, simpler prototype sensing system. This newer hardware is much more advanced and closer to "production". I wonder what this will look like in another couple of months? That's the funny thing about technology. It doesn't stand still while NASA's sluggish PAO efforts do not strive to stay current. By Keith Cowing on February 1, 2012 11:09 PM. "Just the mention of kidney stones can cause a person to cringe. They are often painful and sometimes difficult to remove, and 10 percent of the population will suffer from them. In space, the risk of developing kidney stones is exacerbated due to environmental conditions. The health risk is compounded by the fact that resource limitations and distance from Earth could restrict treatment options. Scientists with the National Space Biomedical Research Institute (NSBRI) are developing an ultrasound technology that could overcome some medical care challenges associated with kidney stone treatment." Keith's note: Wow, a real spinoff with potential applications to a vast number of people on Earth. But is there any mention at the OCT website? ISS National Lab? CASIS? Why is NASA so woefully incapable of promoting the actual benefits from its research that it crows about in Congressional testimony and PAO puff pieces? Keith's update: What is really pathetic - and troubling - is the response posted by ISS contractor employee Justin Kugler in the comments section. Kugler and the people entrusted with the utilization of this expensive national asset seem to be oblivious to the responsibility that they have to explain to all "stakeholders" (including taxpayers) what these tens of billions of dollars have been spent on. When these people can't even get off their collective asses to make note of true and exciting spinoffs of great potential to people (such as this one) you really have to question whether NASA has the right people working on this project - and that starts at the top (Mark Uhran). By Keith Cowing on February 1, 2012 12:55 PM. "It has been years since NASA has had a vigorous, broad-based program in advanced space technology development," said Raymond Colladay, president of RC Space Enterprises Inc., and chair of the committee that wrote the report. "Success in executing future NASA space missions will depend on advanced developments that should already be under way." Keith's note: According to this project description at the NRC, this project began on 24 September 2010 with a projected final report 17 months later. Given the glacial pace at which NASA incorporates advice - and its tendency to only adopt the portions of the advice they actually want to implement - it will easily take another year to align the NRC report and NASA's plan, synch it with the budget, ongoing and new procurements, etc. Only then will NASA be ready to implement what the NRC has recommended. That's a 2 year lag between advice and implementation. Of course, just as the new plan settles into place at NASA there might be a new Administration or a new Congress - both of which will fiddle with everything once again. Net result: NASA is always behind. NASA needs to shorten this cycle such that it can respond to emerging trends in technology as they make themselves known - not wait several years and then play catch up. Note that the committee chair said "Success in executing future NASA space missions will depend on advanced developments that should already be under way." By Keith Cowing on February 1, 2012 12:48 PM. "Climate change caused by black carbon, also known as soot, emitted during a decade of commercial space flight would be comparable to that from current global aviation, researchers estimate. The findings, reported in a paper in press in Geophysical Research Letters, suggest that emissions from 1,000 private rocket launches a year would persist high in the stratosphere, potentially altering global atmospheric circulation and distributions of ozone. The simulations show that the changes to Earth's climate could increase polar surface temperatures by 1 deg C, and reduce polar sea ice by 5-15%." This page is an archive of entries in the Commercialization category from February 2012. Commercialization: January 2012 is the previous archive. Commercialization: March 2012 is the next archive.